Can it really be 21yrs since I first cast eyes upon “Stevie Johnson” on the City Streets of Phoenix, Arizona in that Beautiful blue ‘N white Onyx ORE1 Ford/Cosworth V-8 chassis; Aye Karumba! As previously mentioned, the Anderstorp Circuit landed a Formula One event in just 5yrs time from opening, or as Ticko pointed out; Five years and One day to be exact, and although everything I’ve read says that the Grand Prix came to an end after the unexpected deaths of Swedish Racing Stars Ronnie Peterson and Gunnar Nilsson; Ticko pointed out that although all of the promotional information had been produced, i.e. ; Posters, Press Releases, Tickets sold, etc. 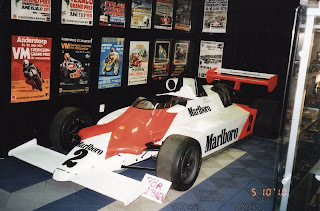 for the 1979 event, the Race was cancelled a scant three weeks prior upon the FIA not being able to guarantee that the Drivers would attend the event. Yet the Scandinavian Raceway Nostalgia Museum sells merchandise with the 1979 Swedish GP’s Poster upon it, as they’ve got a great line-up of black T-Shirts with each year’s event Poster for 1973-79 printed on the front and your humble scribe opted for the year’s 1973 & ’76. While we stood “Kibitzing” about the venue, which Ticko says Anderstorp Circuit is trying to build-up, he casually mentioned the upcoming inaugural Race Legends meeting coming in August... NO! DON’T TELL ME... SHEISA! I WANNA GO! 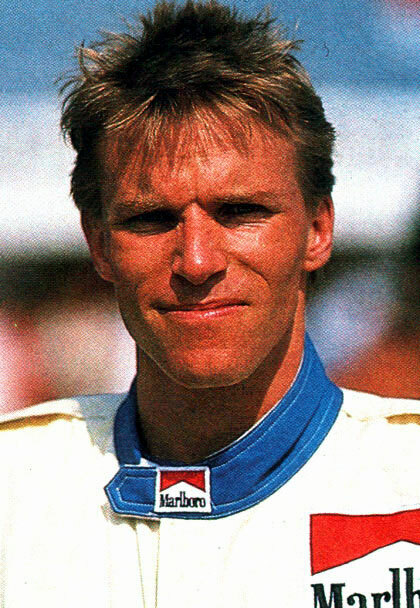 Whale, actually now his name’s been divulged, so I’ll give you a further hint: He used to get strapped in by Professor Steve Matchett and had the most F1 Career starts until ‘Rubino broke his record, as there’s NOW 14 former Formula 1 Piloto’s slated to participate! 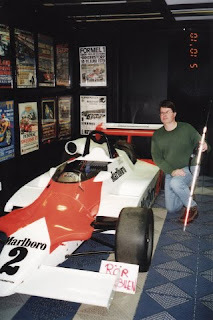 Exiting the Peterson “Shrine,” we entered another room where a gleaming red ‘N white Racecar adorned in those ‘O so traditional McLaren Marlboro “BAD HABITS” red ‘N white colours immediately grabbed my attention... As Ticko informed me that it was the Formula 2 winning Toleman Hart that Stefan Johansson had driven to two wins at Hockenheim and Mantorp in 1981, as Ticko mentioned how the car has now been adorned with Johansson’s “John Hancock,” while this very pleasing Racecar is on loan thru August, as I’d assume its in support of the upcoming Race Legends event. Below are a few more racing helmets, including an original Reine Wisell helmet along with a ‘DC (David Coulthard) replica helmet that his Airbrush Artist friend had made for him for his 50th Birthday... To which I told Ticko; I probably shouldn’t mention that I’m a Schuey Fan, eh? Another Display case houses various artifacts, including more autographs and a Barry Sheen and Angel Nieto race contract, with Great Britain’s Sheen being twice GP500 (500cc) World Champion from 1976-77, along with winning the British 125cc and Formula 750 titles, as ironically Sheen’s last victory came none other then at the 1981 Swedish GP held at Anderstorp, as Barry was then racing a “Privateer” Yamaha against Works Rider Kenny Roberts, before retiring to Australia in 1984 after racing for 14yrs. Nieto, from Italy, won 10 Championships in 50cc and 125cc from 1969 to 1984, with the racing contract being from 1973 when Angel was proudly sporting the No. 1 plate. There was also a pair of wooden clogs that belonged to the ex-GP 500 Dutch riderBoet van Dulmen, (1975-86) who won his lone GP500 event at the 1979 Finnish GP, while Albin & I had great fun joking about how he musta lost them? There were also a pair of Peterson’s unused shoes, as they’d been adorned with the wrong sponsor and couldn’t be worn since they had a rival Oil Companies logo upon them; ESSO vs. BP )Biting my lip ‘bout that NASTY BASTARDOE British Petroleum!) As I can’t recall which was which? There was also a pair of his racing gloves which he didn’t like the fit of, etc along with much Anderstorp TT “Scooter” memorabilia. Ticko told us a great story about a nearby Poster which the racing car in question was completely adorned in Goodyear decals... Only problem being that another tyre manufacturer (Avon?) was the races actual sponsor that year; OOPS! Then Ticko took us into the conference/meeting room and he said; you like Michael Schumacher, look there. As there was a Schuey autograph inside the glass case, as Ticko proudly announced that we were in the autograph room... Next to Shuey’s scribble was local hero Bjorn Wirdheim’s and then shock of all shocks, as I simply broke out in gleeful laughter was none other then ‘Dirtmann’s “John Hancock;” SHEISA! You travel half way ‘round the world only to find Robby Gordon’s autograph gracing a wall alongside Michael Schumacher’s... WTF? As we had a good laugh over Dirtmann’s autograph, as I’d once hounded Robby for it at Portland International Raceway when he drove for Derrick Walker... While Ticko had secured his at Charlotte during a RASSCAR weekend... Hmm? It really is a small world after all, eh? Opposite the long table was a wall full of various Swedish Motor Racing Drivers autographs, from the various different disciplines including Rally, Motorcycling and Open Wheel Racing. Kudos to Ticko for making my visit to the Scandinavian Raceway Nostalgia Museum so enjoyable!